DownTownHostel Interlaken v Interlaken, Švýcarsko: Zarezervujte nyní! The guest will be charged a prepayment of 50% the total price with the booking. July and August bookings are non refundable and must be payed to a 100 % with the booking. DownTownHostel Interlaken is located at the Train Station Interlaken West. It used to be a Hotel in the early 1900’s and has been completely renovated during Winter 2017/2018. 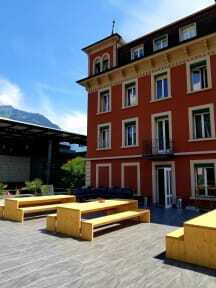 Downtown Hostel Interlaken is a perfect base if you are looking for comfort, convenience and a centrally location. Washing machine-dryer, hair dryer, different Lounge and Smart-TV stations with over 100 channels and Radio Stations, free coffee, water boiler, microwave, extra kitchen ware can be ask at the reception. Our large terrace will invite you to enjoy the great atmosphere of Interlaken and relax from your excursions in the area of the day. In the basement of building is a Night Club located, called Hangover, opening hours between 10pm and 5am, an Italian restaurant, Chinese Restaurant, Oriental Restaurant with Pizza /Kebab, across the street you find a large shopping mall called Migros with parking facilities. As the hostel is located at the Train Station Interlaken West, all the activities will be started from there: Trip to top of Europe called Jungfrau Joch, Boat trip to Thun, Paragliding, River Rafting and much more. Interlaken is the Mekka for Outdoor Sports and they can be booked in and outside of the Hostel. 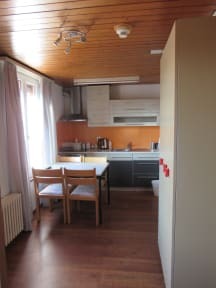 We do offer accommodation ranging from dorms (mixed, male, female) to apartments for 6-12 people, large family rooms with or without TV and lounge, studios with large bed, bathroom and kitchen. We do accept large groups as well, you can add to all apartments the number of dorms you will need for your group. Our rates include free WiFi in all the rooms, linen, personal lockers, free use of I-Mac and printer, coffee and tee, guest card for free bus transportation and a lot of discounts on entries in the area. Check in from 16:00 to 22:00, self check in also after 22:00. Breakfast not included. There is a shopping mall a cross the street. Kitchen with water boiler and coffee / tee available and included in the price. Reception between 09:00 and 22:00, at night self check in. Codes to get in will be sent to the guest. The maximum period of stay is for 31 days.